Where can Arsenal still look to strengthen? 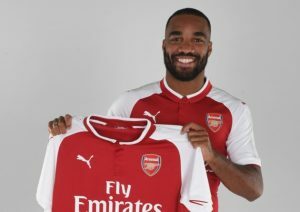 Arsenal fans can be relatively pleased with their club’s summer transfer business so far after signing one of the best strikers in France and one of the best defenders in Germany. Alexandre Lacazette and Sead Kolasinac should slot straight into the starting 11 and improve it considerably. But there is still plenty of work to be done after the Gunners fell to their worst league finish in Arsene Wenger’s 21-year tenure last campaign. Rumours have been flying around but no further signings have been forthcoming, and Arsenal fans will have to hope that club officials are simply biding their time and waiting for a late flurry of activity before the transfer window slams shut. Of course, the main priority has to be keeping hold of star forward Alexis Sanchez and fans are in for a nail-biting couple of weeks as the likes of PSG and Man City continue to be linked with him. If they can keep him for another year they will have a real chance of competing for the title as he is arguably the most devastating attacking force in the division. Nailing down Mesut Ozil and Alex Oxlade-Chamberlain to new contracts would also be a plus. There is also a lot of deadwood to shift in a squad that is looking bloated. Arsenal are prepared to listen to offers for Kieran Gibbs, Jack Wilshere, Lucas Perez, Calum Chambers, Mathieu Debuchy and Carl Jenkinson. If they could shift the lot they would bolster their war chest considerably and make room on the wage bill for new arrivals. But so far only Wojciech Szczesny has been moved on, with Juventus snapping up the Polish stopper. Arsenal perhaps need to lower their demands a little on some of these players in order to give their squad a facelift. The main rumour that will not go away is Thomas Lemar, and if Arsenal could capture the French prodigy it would be a real coup. He blazed a trail of brilliance across Ligue 1 last season as he helped inspire Monaco to an unlikely title victory over PSG. Persuading Monaco to part with him could prove tricky as vultures are picking their team apart, but Man City have twice persuaded Monaco to do business this summer and Chelsea prised Timoue Bakayoko from them. If Arsenal are really serious about signing Lemar, they should chuck another £10 million at Monaco and end the drawn out saga. The Gunners look to be fairly well stacked in the striking department, provided Ozil and Sanchez stay. The new formation Wenger is persisting with sacrifices an attacker in favour of an extra defender, so there are only three starting berths up front and you would have to imagine them going to Sanchez, Ozil and Lacazette. In reserve they would then have Danny Welbeck, Theo Walcott, Olivier Giroud, Alex Iwobi and potentially Wilshere and Perez if they stay. Perhaps then the need is more pressing in the defensive department. Switching to a three at the back system made Arsenal far more solid at the tail end of last season and they were rewarded with the FA Cup. Going into the new campaign, however, they are already facing a fully predictable injury crisis. Gabriel is a long-term absentee, Laurent Koscielny is out, Shkodran Mustafi is out and Per Mertesacker missed the curtain raiser against Leicester too after taking a whack from Gary Cahill in the Community Shield. If Arsenal were to sign a superb centre-half it would be a real statement of intent. Goal scoring has never been their problem, but leaking goals has. A £60 million splurge on Virgil Van Dijk would galvanise the club. A holding midfielder would be a brilliant addition too. Arsenal accepted a bid for Mohamed Elneny this summer, showing Wenger does not rate him, but the Egyptian opted to stay and fight for his place. Meanwhile Francis Coquelin has gone backwards, and a real strong presence in the midfield engine room would be a huge bonus. Granit Xhaka and Aaron Ramsey are neat and tidy players that like to get forwards, but both lack discipline and neither is strong in the tackle. If Arsenal spring a couple of surprises between now and September 1 and strengthen their core then they could be a real threat this season. Certainly without the burden of playing in the Champions League they should get back into the top four as a bare minimum. In the latest sports spread betting you can buy Arsenal at 74 points, which looks a great bet. They racked up 75 last season and it was a huge disappointment. They have since bolstered their side, there is no more uncertainty around Wenger’s future and they should keep hold of Sanchez, so there is every reason to think they will get 80 or more points. But some more signings would be nice as their rivals continue to strengthen. Martin Green is an Arsenal fan and would love to see defensive reinforcements brought in. This entry was posted in Arsenal News, Arsenal NewsNow on August 14, 2017 by Admin. Definitely need a holding midfielder so either Ramsey or Xhaka can have licence to attack as neither are good at defending! Dont know who this person could be of we jave tp buy .. if from our current squad then maybe if we keep Ox as LWB (though I prefer him over Belerin at RWB) then Kolasinac could go to left of midfield? Or Gabriel? JUST IN:News coming in is that Arsenal and Chelsea are close to agreeing a £35.7 deal for Alex Oxlade Chamberlain.Newcastle have enquired about Jack Wilshere but Arsenal want £20 for him. Arsenal and Liverpool both want Julian Draxler with his preferred choice to be Arsenal but that asking price of £60 is unlikely to be met. If the Ox leaves for Chelsea then we have taken a step back and will need major reinforcing, coupled with the fact we have been stagnant in the transfers and have failed to release certain players in order bring in new ones, it wouldn’t look good for Arsenal if the Ox leaves. We also haven’t resolved the uncertainty and issues facing keeping star players like Ozil and Sanchez so if the Ox does join Chelsea, which I consider to be a first eleven player and will be strengthening our opposition, we will be looking at a huge crisis and a deficit in terms on quality. Hence I am highly doubtful that Arsenal would weigh in on selling him given the current predicament we are in. 1 midfielder + 1 defense(like Thomas Lemar & van Dijk respectively), otherwise it will be difficult to be title champion!!!!!! The system needs to change. Arsenal has been using the same system in the last ten years and it clearly doesn’t work. The players are instructed to pass the ball quickly and the fast tempo often makes a lot of mispasses. If they could possess the ball longer and lower the tempo, Arsenal could minimize the number of mispasses and they could wait for better chances to break the opponents. Possessing the ball longer means the players have to have very good skills, otherwise they will get robbed a lot. This is why Arsenal has to avoid players that rely too much on their physical attributes. Players can come and go. But Arsenal will get similar results at the end of each season, as long as the system is the same. I agree, but change will never happen until Wenger leaves. He’s FINALLY changed the formation, which has been a huge success, but the system is still the same. It’s Wenger’s philosophy, so it won’t change whilst he’s here. That being said, we were excellent attacking wise against Leicester. A lot of shots off, and on target, which we don’t usually see from Arsenal. I’ve lost count in recent years the amount of times we haven’t even managed a shot on target in the first half of a game. I felt we were moving the ball into the final third a lot sooner than usual, and we were a lot more proactive in that final third. From what I’ve seen against Chelsea, and Leicester, we’re creating more scoring opportunities, so hopefully that can continue. However Arsenal’s main problem is the balance between fast and slow tempo.They just play the ball anyhow without direction. the synergy between fans, manager and major shareholder needs serious improvement as seen by comparison with chelski fans and roman abromivich. kroenke has a management presence like to to being a ghost one moment here the next he’s gone – he could show interest in arsenal which on evidence he shows none. surely the strength of our team is dependent on input from those up top. I use his shareholder position in terms of significant “management and implementation capability”. Van Dijk is just another luxury injury prone CB….and again the fans would be calling for a new CB to be signed next season…. hafiz – sensible comments there? Sorry Hafiz but Goretzka has stated that there are NO AGREEMENT with any club and rubbished the rumors of him going to Bayern. thanks. it took me few minutes to know than @John Ibrahim was referring to Goretzka when he mentioned Leon. calling players their first name on public discuss can cause problems. Last name (Surname) is usually better. I share in your opinion.People seem to think Arsenal signing another CB will solve our problems.We’re just going to waste money on what we don’t need.We’ll be back here asking for another CB after next season.After siging Laca I thought Wenger would targrt a player who’d be a cross between defense and attack in the centre of the pack.But he just goes on Lemar this Lemar that.Funny thing is a lot of talents above him are not rated by some people here.We only needed two or possibly three players this window but Wenger’s making it look more difficult than it is.I felt after signing them he’d apply the right tactics,combinations and mental strength to the team which quite frankly is lacking.I also felt the three back against some teams is meaningless. The main area for Arsenal to strengthen is their MENTALITY . Too often when we win a hard fought victory as we did against Leicester we end up loosing to a smaller team because the players suddenly believe they are the Invincibles 2.0 . We need to take EVERY TEAM SERIOUSLY and not underestimate so called minnow teams . Another brilliant suggestion.Mentality and poor system has denied us time and time again.That’s the main reason why some of us want Wenger gone.It’s not because he’s past it which I believe he’s not butI feel his mentality for Arsenal is dead.The players are also feeding of the same thing.That’s why a team changes a coach with the same players and all of a sudden they do better.It’s not magic but just system and mentality. As you rightly write, leaking goals is the problem. It was in preseason, in the first match, and it has been the problem many seasons. Unfortunately, I think it is a managerial problem more than it a “personnel problem”. Our players are simply not taught to press hard and quick in an organized way, so even mediocre teams can get loads of chances against us, and it will cost in the end. We need a new defensive approach, when we don’t have the ball. ..did we have a captain on the pitch v lcfc can anyone recall or did it go over all of our heads? Seri is close to veratti and Cazorla, not world class yet, but can be at Arsenal, he would drive our game and with the current attackers we have we will win games,but he can’t defend well. Van Dijk if he agrees to come Arsenal, or Koulibaly for other options. Willaim Carvalho would slow down our game, Idrissa guaye would add defensive mobility, eventon would sell him and raise the money for sigorsson. The problem of Arsenal is both from Wenger and the players this is because some times even if the players have not played well Wenger is pressing why? Nothing will happen this window unless something drastically happens to one of our key players. Arsenal are content and concentrating on shifting deadwood which would open up options for future windows. Can only see more in-comings if Arsenal were to sabotage a deal for Davinson Sanchez from Spurs of Carvalho from West Ham respectively which I can’t see them doing. Will most likely sell 2-3 players for the remainder of this window, Perez, Chambers and maybe Wilshere. I like the idea of another CB, like Davinson Sanchez, VVD, Vogt, Pezzella, think Aurier would be a great fit there if you could get him. Oxford would be a good long term signing in that position too but is on loan and would be hard to get out of West Ham. Still need to strengthen midfield. Seri, Keita, Demirbay are good targets. A GK is crucial in the next two years too, why we didn’t go for Pickford is beyond me!